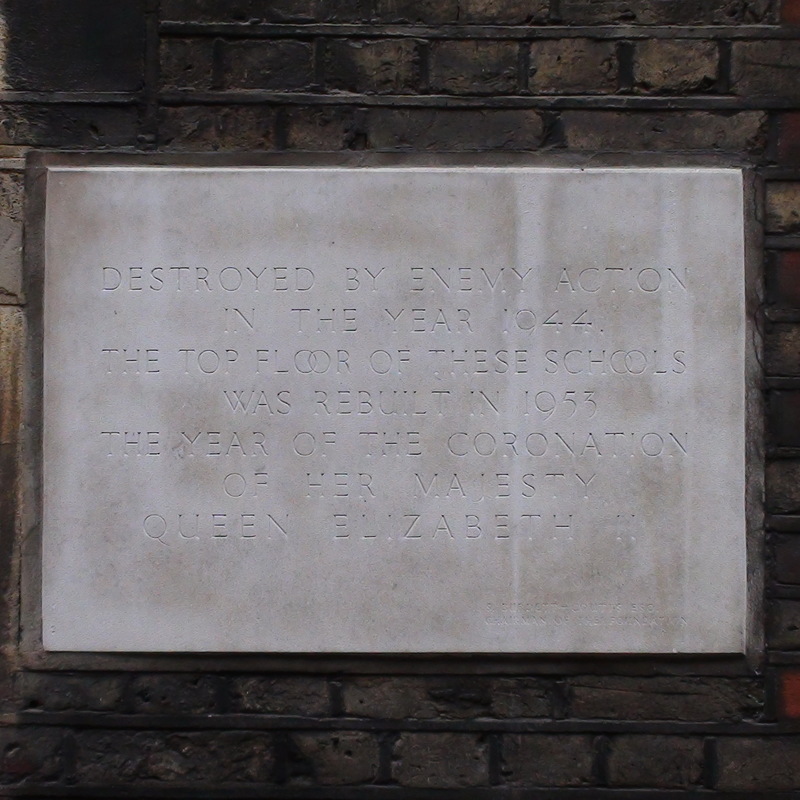 Destroyed by enemy action in the year 1944, the top floor of these schools was rebuilt in 1953, the year of the coronation of Her Majesty Queen Elizabeth II. This plaque is on the central cotagey-looking building which looks undamaged. While the tall, three-storey building to the left looks very much like its top floor might have been rebuilt in 1953. The central, rather cotagey, building has both CHT plaques, the terracotta plaque to the left of the entrance and the war damage plaque to the right. The church extension is to the right of the school in rather cleaner stonework with the plaque below the Gothic window. The website of the school helps us to understand the school plaques. "In the early 1840s, the Bishop of London informed the Dean and Chapter of Westminster that Miss Burdett-Coutts had approached him with a proposal to build a church and school in Westminster in memory of her father and that she would like this memorial to be the centre-piece of a new parish bearing the name of St. Stephen. The area he had in mind was then one of the worst slums in London; an area bounded by Rochester Street, Rochester Row, Vincent Square, and Bell (now Elverton) Street. There were originally three schools: a boys school, a girls school and an infant school (called Townshend Foundation). In 1849, the main school was built and on 21st August, 1907, the combined schools became the Burdett-Coutts and Townshend Foundation School, Rochester Street." It's not clearly stated but we imagine that the cotagey building was the Townshend Primary school, and that the large, tall building to the left housed the boys and girls schools. Dame Agatha Christie 1890-1976 Author lived here.